This past August, we presented a progress report to the Board of Supervisors and are very happy to report that, by unanimous vote, the Board extended our existence as a division of the Economic Development Board into the foreseeable future! There are certain milestones in our development that are worth tracking. According to PBS’ Child Development Tracker, as a 3-year old, we should be able to understand stories, songs and poems (check! ); learn through exploring (check! ); and our favorite, “build on our abilities in the creative arts by developing greater control over our voices” (check!). 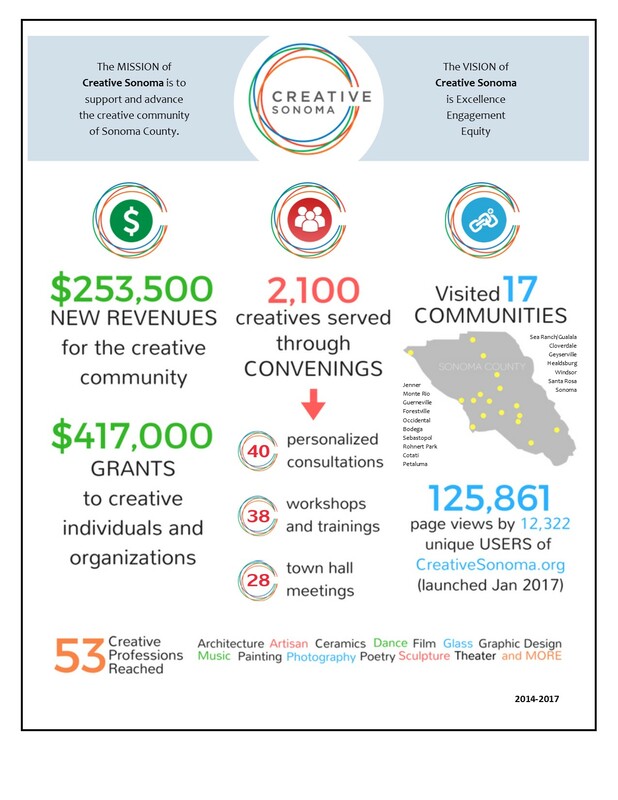 This infographic identifies some of our key accomplishments to date, done with an eye on our core values: excellence, equity, and engagement. None of what is enumerated here was accomplished in a vacuum; it is the collective consequence of this creative community in action. And we’re just getting started, so stick around for more!